The Offset Project crew, led by Kristin Cushman (center, at Offset Project EV charging stations) wants to measure how biking reduces carbon emissions via a bike barometer. By recycling and composting one item at a time and educating one person at a time, The Offset Project has been able to grow exponentially in the region in just under a decade. 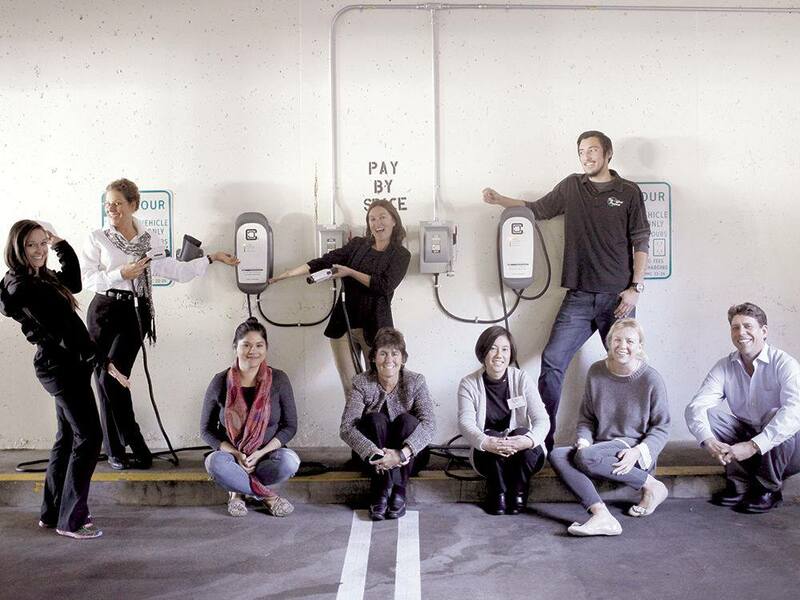 What started as a small nonprofit with complex ideas and 15 volunteers is now at the forefront of a fast-growing local effort to invest in solar and electric vehicle-charging stations, as well as promoting bike ridership and recycling projects throughout Monterey County. “We are trying to get people to think about how they can live a mindful life and have a legacy project,” says Kristin Cushman, who founded the nonprofit in 2007. Motivated by a mixture of moral conviction and a rising concern over climate change, Cushman has pushed small and big local companies, as well as community members, to join the movement. One of the bigger companies working along with the nonprofit is the Pebble Beach Company. Beat Giger, the company’s director of special events, says “baby steps” were taken for seven years to get to the point where 93 percent of garbage accumulated during massive events like the Concours d’Elegance is recycled and reused. “It’s little things, and after a while it amounts to 93 percent,” Giger says. Some of the adjustments the company made involved purchasing choices – buying biodegradable plates, utensils and coffee cups – and recycling wood and carpeting used at the events and composting refuse. The Offset Project’s big idea through Monterey County Gives! this year: raise $20,000 for the region’s first bike barometer, which would track and quantify how carbon emissions are reduced by biking. The barometer would go in Monterey, at a precise location yet to be determined. “This is a tool for the city to be able to quantify the benefit of bike riding,” Cushman says. As Cushman continues to take on one project at a time, her legacy becomes stronger. “I’m just excited people are learning and becoming more sustainably minded,” she adds.